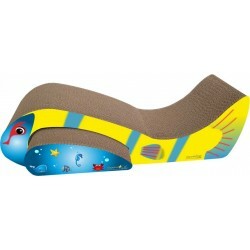 The Purr Lounge is a two-in-one nesting scratcher combo that features sleek curves designed for scratching and snoozing. Important regarding Imperial Cat patters Please note before ordering: Please note many of Imperial Cat items are produced in assorted patterns. This means the patterns you receive may vary. The company is constantly adding new patterns to keep the selection fresh. The Purr Lounge is a two-in-one nesting scratcher combo that features sleek curves designed for scratching and snoozing. Attractive, modern design complements home décor. Made in the USA from recycled paper. Features a scooped top for napping and a tunnel area for play. Bag of 100% certified organic catnip included. Measures:33.75" L x 10.5" H x 9" W.